Ooompah band, sausages, beer, & Germans. A great end to a nice day - sunny weather, less wind, & some slightly stronger running from yours truly. My feet are nastily swollen, & I've gained yet another pound - the medical experts are speechless! Thanks again - family, friends & co-workers - for all the kind posts & messages. They do keep me going through the tough times. 7 days & 533K (325 miles) done, but a few more hills ahead. Amazing - It sounds beautiful there, we are all thinking of you. Di needs to call Forte Tuesday. Fantastic. Simply fantastic. I'm really enjoying some vicarious distance-running here! Looking forward to your continued upbeat postings, and the inevitable foot photographs at the end. Enjoy the brats, sausages, beer, and German hospitality. Your doing great and making us proud. Thanks for posting everyday and letting us follow you along on your adventure. Hi Russ! My friends don't believe me when I tell them that my boss is running across Germany. I send them to your site and all have e-mailed back in awe. Way to go, boss man! I'm glad to hear you are not only withstanding the suffering but finding small wonders in the people and place. Keep looking around and not at your (swollen) feet! clemmie here. It's fun to read your blog. Weight gain, big hands, all rather weird. but interesting time, I'm sure. Russ - beer, sausages etc - what are you on hoilday? - focus mate! When you are finished I suggest a trip to Koln (Cologne) Chocolate Museum to get a little more German weight gain. Though I traversed it by train, it's a great country to travel. Ah Russ, you take me back to my childhood! Nothing beats a good sausage, save for toenails or a soft bed. Say hello to all the Degners for me. Russ, "Every worthwhile accomplishment, big or little, has its stages of drudgery and triumph; a beginning, a struggle, and a victory." I look forward to toasting your victory. Dude! enjoy the sudds and brot. 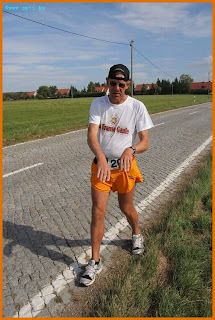 Do they have an announcer at this finish line you are heading for? I was telling my kids about what you are doing and they were amazed. Thanks for being an example of what is possible. I am sending you strength via the cosmic karma network.